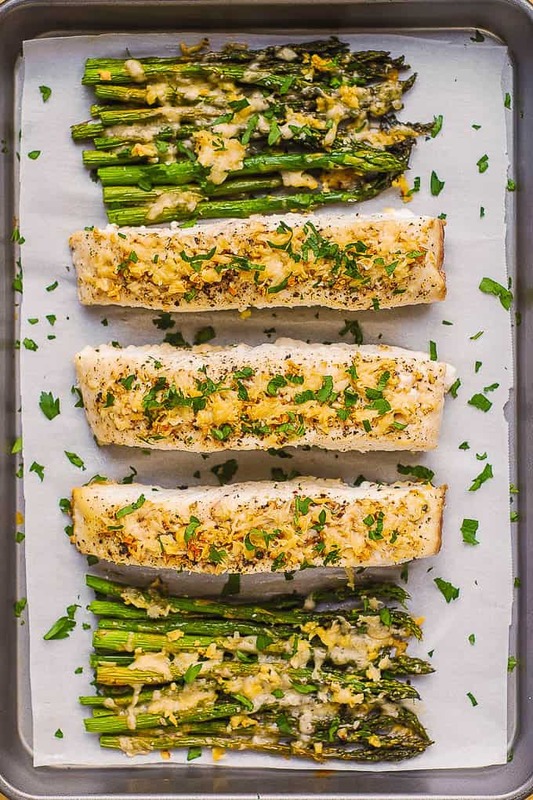 Garlic Parmesan Crusted Halibut and Asparagus baked on a sheet pan in the oven – easy, quick, and delicious! Minimal cleanup as everything is cooked on a baking sheet lined with parchment paper. This dish is high in protein, fiber, packed with omega 3 fatty acids. Healthy, gluten free, low-carb, KETO friendly recipe! The best and the easiest way to cook halibut is by baking it in the oven. Only one pan is used (baking sheet). 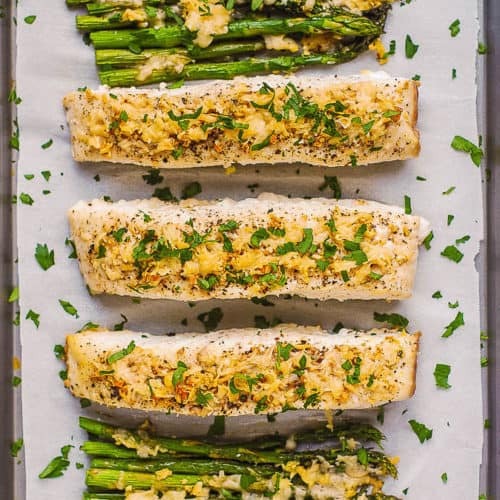 In this recipe, both halibut and asparagus are crusted with garlic and freshly shredded Parmesan cheese, which adds wonderful flavor and a crunch to the dish. Halibut is a lean fish with a firm yet soft texture and a mild taste. Because it is a lean fish, it is easy to overcook as it dries out faster. Tip: Serve it immediately after cooking to prevent halibut from drying out. Do not let the baked halibut sit on the counter. Do not reheat it in the microwave. Make sure the halibut is served right after it’s cooked. Halibut is rich in protein and has a good amount of omega 3 fatty acids, which makes it a perfect choice for a KETO diet! If halibut is unavailable, you can use sea bass, cod, mahi mahi or flounder. 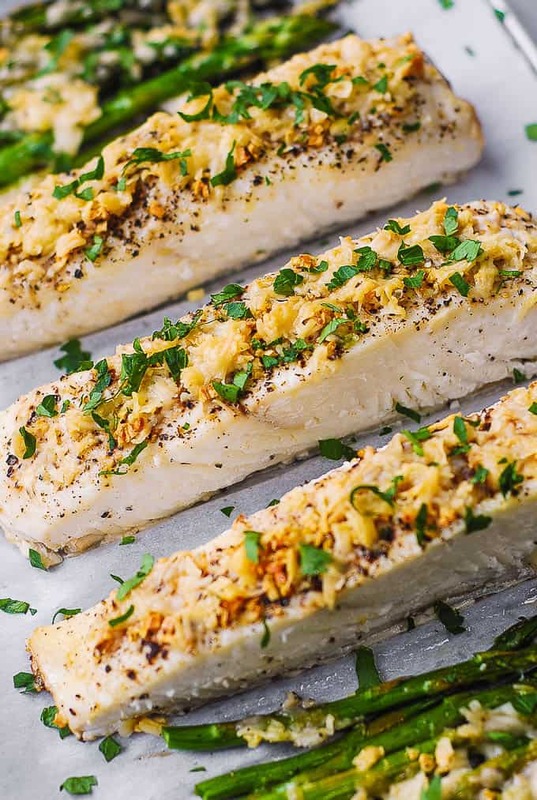 Combined with asparagus, garlic, olive oil, and Parmesan cheese, this baked halibut recipe makes an excellent KETO friendly main course. Halibut requires basic seasonings, such as lemon juice, minced garlic, salt and pepper. You can also use spice rubs made specifically for fish. Or, use herbs (either dried or fresh), such as thyme, oregano, dill, rosemary. You don’t have to skin the halibut since it cooks better and keeps its shape better with the skin on one side. Once cooked, the skin can be removed easily from the fish. Use fresh halibut, preferably never frozen. Line baking sheet with parchment paper to minimize cleanup. Serve immediately after baking for best halibut texture. The longer the halibut sits, the drier it becomes. Do not reheat in microwave. Preheat oven to 400 F. Line half sheet with parchment paper. 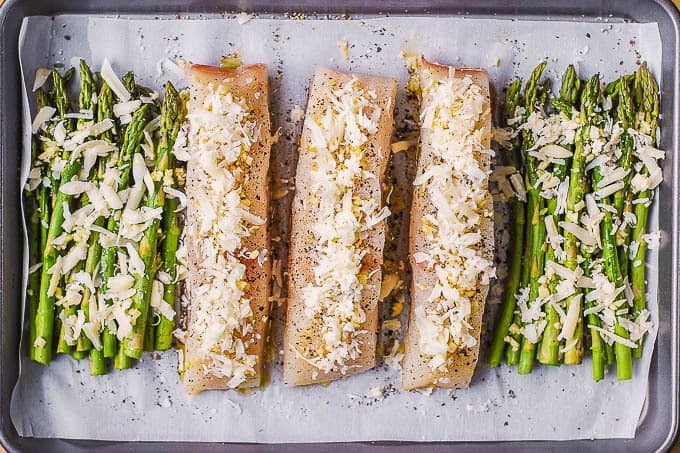 Place halibut fillets in the middle, and asparagus around it. 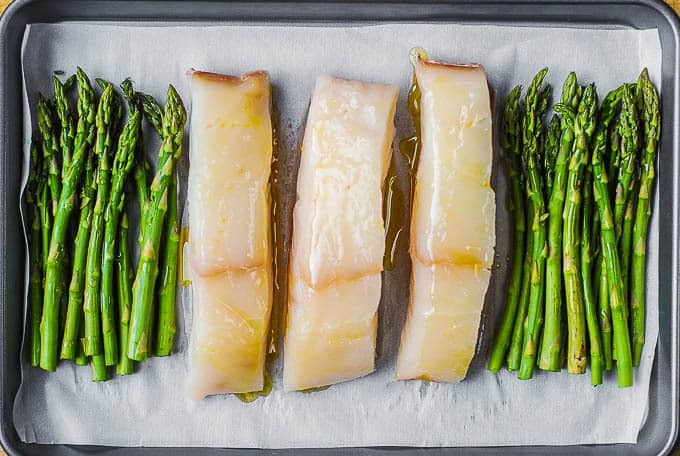 Brush halibut and asparagus with olive oil. Generously sprinkle with salt and cracked black pepper. Top with minced garlic and shredded Parmesan cheese. Bake for 15 minutes until halibut is flaky. Bake for 15 minutes in the preheated oven at 400 F until halibut is flaky. 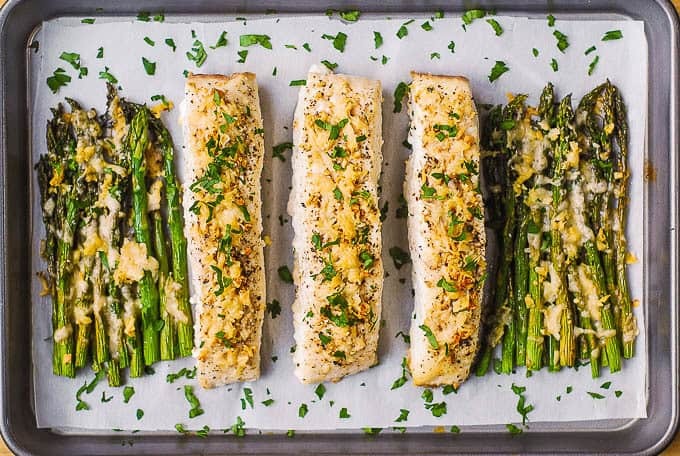 Garlic Parmesan Crusted Halibut and Asparagus baked on a sheet pan in the oven. This easy recipe is high in protein, fiber, and packed with omega 3 fatty acids. Healthy, gluten free, low-carb, KETO friendly main course! Preheat oven to 400 F. Line half sheet with parchment paper. 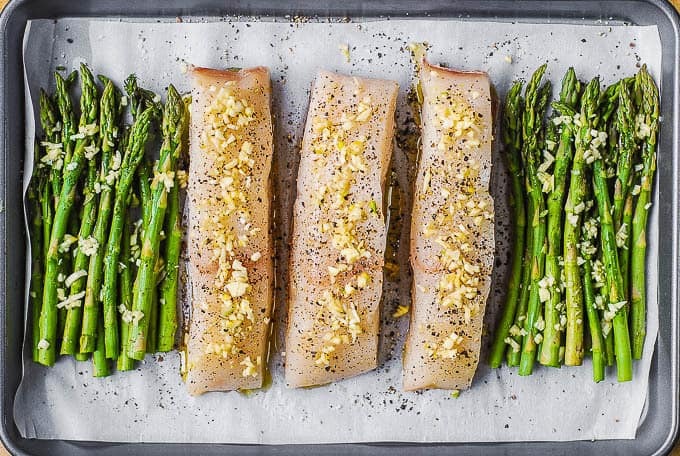 Place halibut fillets in the middle of the baking sheet, and asparagus around it. 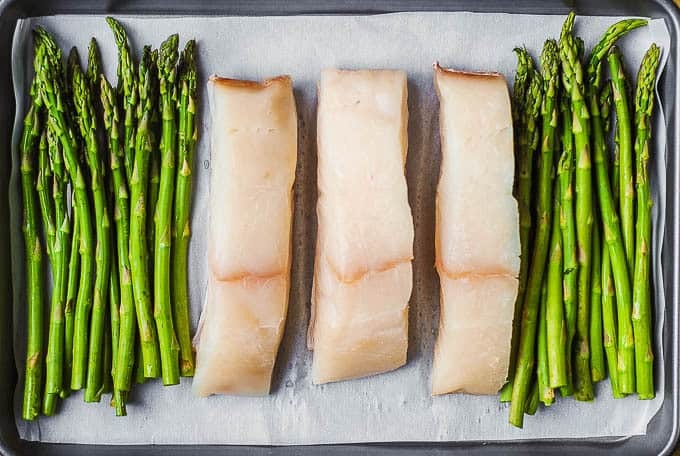 Brush halibut and asparagus with olive oil. Generously sprinkle with salt and cracked black pepper. Spread minced garlic on top. Top with freshly shredded parmesan cheese. Bake for about 15 minutes until halibut is cooked through and flaky. OMG! Fantastic, this will be going into a regular rotation for dinner. So enjoyed this recipe! So simple yet totally yummy!